A local elementary school is now using a rare teaching tool, one used by just a handful of schools throughout the country. 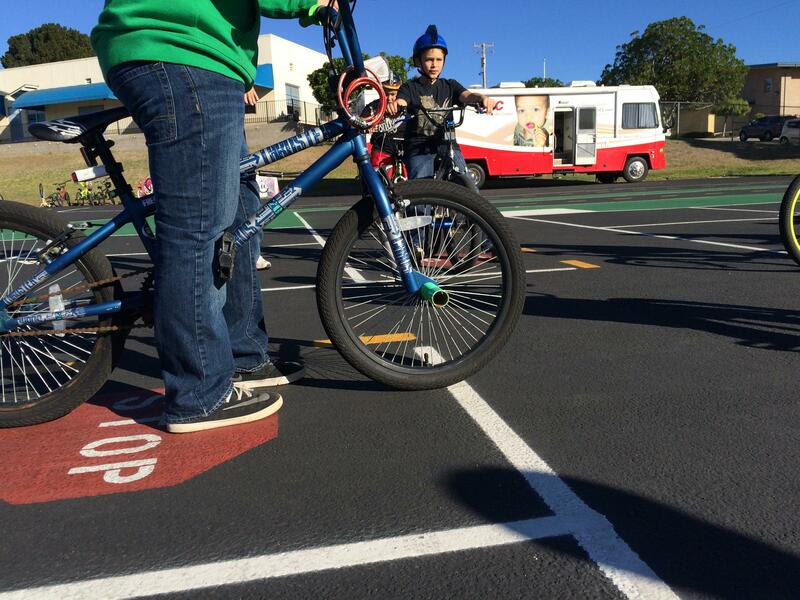 Fifth graders at Oceano Elementary practice how to proceed at a four-way stop on the school's recently completed bicycle course. It's painted on the blacktop and simulates real-life traffic situations. The school participates with San Luis Obispo County's Safe Routes to School Program, a product of Rideshare. Sara Sanders is the organization's Program Coordinator and oversees schools in the region. She also designed the track. "I made the simulated streets a little bit smaller than a typical bike lane, so these students could practice how to maneuver those," said Sanders. "Some streets don't even have bike lanes." Sanders worked with Oceano teacher Jim DeCecco, who brought the idea forward after he saw a similar bicycle course in Europe. Oceano Principal Ron Walton said the school paid to paint the course, but other factors can drive the price up. But in this case, Oceano was already resurfacing its blacktop and Sanders donated the design. Walton said even before the course, the school embraced alternative forms of transportation. "What we're doing is getting the educational component in early, which is very appropriate. Kids are kids, so they need constant practice at doing the right thing on the road. So that's kind of where we think we are. And if we can set a new model for schools, or parks, or cities, to do this kind of thing, in different locations, it can only be good," said Walton. There are several alternative transportation programs throughout the country, encouraging students to bike or walk to school. Nancy Pullen-Seufert is the Associate Director for the National Center for Safe Routes to School based in North Carolina. She says her organization knows of about ten of these permanent bicycle courses in the nation, and they are mostly seen in California schools. "Certainly in a lot of ways California is a good indicator of the direction that the rest of the country is going, not in all things, but a lot of the time," said Pullen-Seufert. "For a good portion of California, the weather and in some cases the topography make it more possible for bicycling than in other parts of the country. Pullen-Seufert said we're seeing efforts to encourage walking and biking in communities throughout the nation, and one component of that is keeping kids safe. Ways to accomplish that, like practicing bicycle skills, she said is certainly of increasing interest. Concerns over immigration raids this week in the Salinas Valley are beginning to subside. The fear of deportation grew out of rumors following a high-profile arrest in the City of Greenfield. A number of parents in Greenfield kept their kids out of school on Monday over fears the federal government might raid the facilities. Governor Jerry Brown signed a bill Wednesday by local State Senator Hannah-Beth Jackson (D-Santa Barbara) to create an after school program aimed at giving students healthier options. It's called the California Distinguished After School Health recognition program—or DASH. In order to be DASH certified, programs must limit "screen time"—the time spent looking at computers or television—and serve healthful foods daily, requiring fruits and vegetables, and banning foods with high sugar or sodium content. There is a search underway for more artifacts buried deep in the sands of the Guadalupe-Nipomo Dunes. Instead of digging, archeologists are first taking to the sky to find these treasures.